After having neglected my lovely Murena for 3.5 years, while I was rebuilding my new house, I today FINALLY found time to give it a little of my time. The engine has for over a year not been able to get started, due to lack of ignition - something that previously was an intermittent fault, now become permanent. I soon found myself focused on the 6-pin connector in the passenger-side of the front, leading to the back of the car - and found several of the pins badly corroded, to the point of almost not making any connection at all ! All the threads in the wires looked fairly sad - some almost black, so I applied the trick I had read about on the Internet : Vinegar saturated with salt - and stuck the exposed wires in there for 10-15 minutes. This actually WORKS, - and the wires came out looking shiny and NEW ! - a quick rinse in baking-soda dissolved in water neutralises the acid, and I set about putting new pins on, and assembling the connectors. - even if there is a fat 12V supply (which was very corroded). loose and fell out of the connector. And this was indeed the ignition wire ! The other is for cranking, and that seems to work just fine. baking-powder solution, hence it looks fairly clean on the picture below. The connection between the different poles is achieved by L-shaped, spring-loaded anchor, which is moved around - all of this fell out on the table as I took it apart, so I bneeded to figure out how it was supposed to be assembled before undertanding the workings. 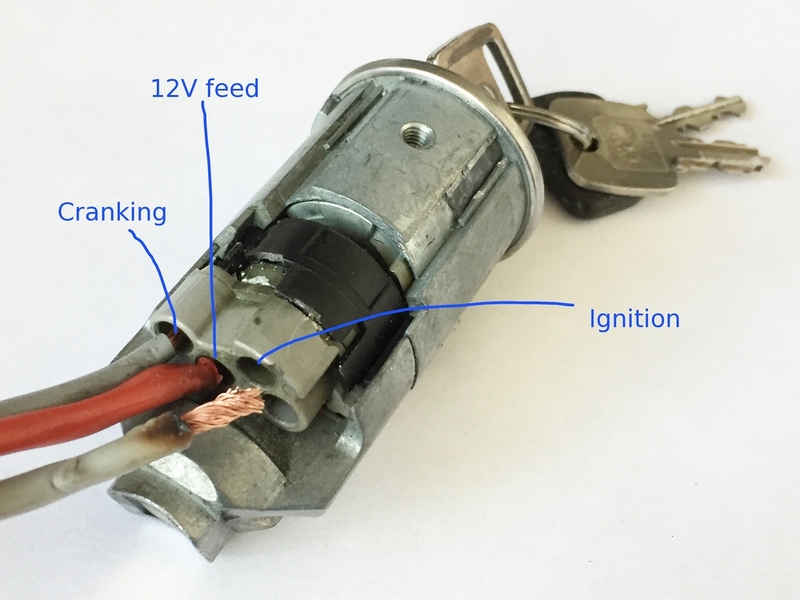 The centre of this L-shaped anchor rests on the 12V feed, and the spring-loading should make it slide over the contacts in the periphery - first only ignition, but when you turn fully, the starter motor unsurprisingly get a feed too. Assembling the connector was a bit fiddly, as the tiny spring is loose, but I dabbed a tiny droplet of superglue on it, so the L-shaped lever and the spring was one unit (for now) - then it was just a matter of figuring out how to align it properly with the lock barrel, but after a few attempts, I got it right, and the ignition lock tested fine using my multimeter. Back in the car it works just fine - actually consistently switching the charging lamp on when the ignition comes on - this was one of the observations I had made before.